WPHA will be present at Almedalen and our aim will be to reach out to the politicians, media, policy makers and people of important influence in/on the Swedish economy. All of Sweden’s focus will be shifted towards the small Island of Gotland, giving us the best opportunity to discuss the issues directly with the key people who have the ability to change the laws or at least affect the outcome of the upcoming suggested law changes. This makes our short presence in Gotland important for our long term stay in Sweden. If you can, please do join us. More details will be shared soon. As we (WPHA) are one of the participant of Almedalsveckan 2017. Swedish Radio will record our interview today (4th July) 17:00, at Sergels torg . So we are requesting u all ,those who are able to join with us , please come at Sergels torg by 4:45 today. After that another group of WPHA members will start journey for Almedalsveckan. Our official participation dates are 5th July and 6th July at Almedalsveckan. Our Booth number is 232. June 18th, Work Permit Holders Association organized another peaceful protest, which aimed at attracting both media and public attention, and tried to get in touch with Swedsih Prime Minister Stefan Löfven, who was holding a speech at Järva Week political forum 2017. WPHA calls on suspending deportations until new labour bill suggested by the Swedish government comes into power. 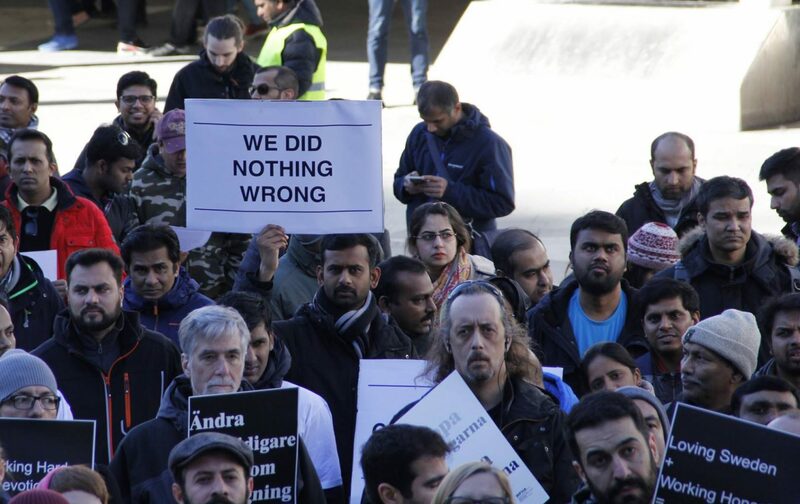 This is a demonstration made by immigrant workers in Sweden, who are currently receiving deportation orders from the Swedish immigration authorities (Migrationsverket). Currently, although all parties agree that the deportations are inappropriate and unjust, there’s not much political action done other than basic right-wing vs. left-wing rhetorics. Struggle of the work-permit holders in Sweden, who are being deported due to employers’ small faults.